The number of international students studying at U.S. colleges and universities reached an all-time high of 723,277 during the 2010-2011 academic year, according to the Institute of International Education. For students who aren’t ready to spend four years overseas, summer programs for high school students offer a short-term preview of life in the United States while honing their English skills, sampling potential majors and careers, and meeting other international students. 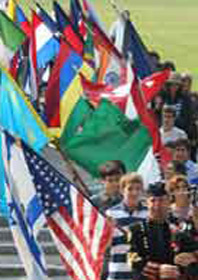 Many U.S. boarding schools count on international students for a significant percentage of their student bodies. Students from overseas may enroll in standard summer session courses or specialized programs offering ESL instruction and activities designed to help students acclimate to life in the United States. Located about an hour from Boston, the Cushing Academy Summer Session offers a five-week ESL course to students entering grades 9-12. The immersion program features small class sizes and experienced ESL teachers--international students make up 25% of Cushing’s student body. * Students prepare for the TOEFL or TOEFL iBT and practice language skills in arts and sports activities and dorm life with American students. Nearly 50%** of students attending Phillips Academy’s Summer Session in 2011 came from another country. A general ESL course is complemented by seminars focusing on journalism, multimedia, TOEFL prep, speaking, analytical skills, and essay writing for ESL students. Students experience life on an Ivy League campus at Brown University’s Pre-College Intensive English Language Program. The program combines language study with challenging liberal arts courses. Electives focus on English for business, TOEFL prep, and theater study. Young musicians should check out the Berklee Summer Performance Program, where international students from more than 70 countries accounted for 27%** of 2011 attendees. The five-week program offers tracks in jazz, pop/rock, funk/fusion, and pop/R&B vocals. Students who are already proficient in English can choose from a wide range of precollege summer programs offering advanced courses, career previews, and even college credit. Summer program applications often require TOEFL scores (even for programs offering ESL) and may set earlier application deadlines or higher application fees for international students. Financial aid, if offered, may be limited and distributed on a rolling basis. Visa requirements also vary from program to program. Because summer programs are shorter than 90 days, participants may attend without a full visa under the Visa Waiver program available to 36 countries. Students must meet minimum requirements and possess a passport valid for six months after their stay ends. Other programs require an F1 student visa, so make sure to give yourself plenty of time to complete the application process. Find more summer opportunities for international students on Summer Program Search to (select ESL under Academic Specialized), and for more advice on studying in the U.S., check out Yumi Araki’s international students blog on CollegeXpress. Jim worked as an Editor at Porter Sargent Handbooks from 2005 until 2012, following his graduation from Northwestern University with a degree in journalism. Jim’s first task at Porter Sargent was to research summer programs for the Guide to Summer Camps and Summer Schools, published since 1924 to describe recreational and educational summer opportunities for kids and teens. Jim helped to make the Guide’s 1600+ program listings fully searchable online at SummerProgramSearch.com. In his free time Jim enjoys reading, playing guitar, and seeing live music. He spent his own high school summers in suburban Boston working at a supermarket and freelancing for local newspapers. You can circle Jim on Google+, follow him on Twitter, or subscribe to his CollegeXpress blog.